High-profile synth programmer, remixer, and recording artist Pete Gleadall is a man of many talents. MATT BELL talks to him at his studio about his part in the making of the new Pet Shop Boys album, his work for George Michael, and the role of the modern programmer. Pete Gleadall is a successful programmer who has worked with U2 and Tina Turner, and toured the world with the Pet Shop Boys. Ever in demand, he has recently acquired further fame as a key member of the group 4thright, the first production team to be given carte blanche by George Michael to remix his songs in any way they saw fit. On first-name terms with both Neil Tennant and Chris Lowe, as well as ‘George’, there is no denying that as far as the music business is concerned, Pete has cracked it. And yet… it could all have been rather different. As Pete admits while looking back on his highly successful career so far, ‘it was really a classic case of being in the right place at the right time’. Pete’s never looked back, landing the job of programmer on the Pet Shop Boys first live tour in 1989 on the strength of his handling of the Faith tour. The success of this tour in turn ensured a permanent place for him in the Pet Shop Boys entourage. He also programmed and co-engineered the 1993 Pet Shop Boys album Very, sharing the latter credit with previous PSB engineer Bob Kraushaar, with whom he struck up a successful working relationship. 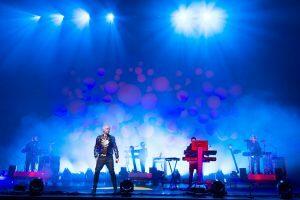 Now, in 1996, the engineer/programmer team of Kraushaar and Gleadall has completed work on the new Pet Shop Boys album Bilingual, recently released. Meanwhile, Pete has continued his association with George Michael, having programmed several tracks on the Older album, and remixed Michael’s ‘Spinning The Wheel’ and ‘Fast Love’ as part of the aforementioned 4thRight. I visited Pete in his London studio, Hoedown City II (HCII), to discuss these recent projects and talk technology. HCII is a project studio to be reckoned with. An Apple Mac running Emagic’s Logic Audio and a Pro Tools system form the heart of the setup, while modular pods containing synth modules and samplers — the hardware tools of a programmer’s trade — dominate one side of the room. I began by asking Pete to describe his tasks as a programmer. ‘It depends on the job. With the Pet Shop Boys, I’m a sound library — I don’t actually play much. I get sounds up for them, record what they do in Logic Audio, and manipulate it for them. I fly vocals in, or tune them. Recently, Neil [Tennant, Pet Shop Boys vocalist] said he wanted that Babylon Zoo vocal sound, from ‘Spaceman’, and I had to get that. Chris [Lowe] will give a very specific list of things he wants: a French horn, a Russian choir, an exploding boiler. He can be quite specific about the kind of sounds he wants, too — he might say ‘Let’s have a 909 bass drum, a house loop, some vibey congas, and a tambourine’ — or he might do it by referring to another record. ‘I’ll find what he wants, and then, if we’re starting with a rhythm loop, I get that in time at the tempo he wants, and sit there recording everything he does. ‘With someone like George Michael, I generally do what I do with the Pet Shop Boys, only I play very little. He gets musicians in to play stuff he can’t play himself. He doesn’t use them for their ideas, as he generally has a very clear idea of what he wants. With him, it’s just recording what he does, and then rearranging what he’s played according to his instructions. Pete elaborated on this point, explaining that he doesn’t just create sounds in isolation, and leave it to Bob to make them fit together technically, but considers how they will blend together. ‘Sometimes you create sounds, and you realise there’s a problem with them later — sounds with a lot of sub-bass on them, for example, which you only realise when you get them on a big system. ‘It doesn’t hurt to be aware of what things go with each other. For example, if you use two sounds off the Korg M1 in a track, you’ll have a bit of a battle, because all the sounds have got very similar frequencies. On the other hand, I could do a track with just a Juno 106 and a sampler, because you can have a Juno bassline, pad, synth sound and top line, and they will each take up their own space in a mix. ‘I used to be generally much more precious about sounds and samples than I am now. Now, I’m happy to give almost anything away, unless it’s closely associated with a specific artist’s record, like the sync sweep off the MKS80 that’s on the Pet Shop Boys’ ‘Was It Worth It?’, for example. If somebody asked me to give them that sound, I wouldn’t, but I would give them a selection that was similar. ‘I also use sample CD-ROMs a lot. For a programmer, the English music scene is now so fluid — one minute jungle’s in, the next it’s history — that if I’ve got a project to do and I don’t think I’ve got it covered, soundwise, I’ll buy a sample CD. I think they’re absolutely fantastic, because when I first started sampling, I had to borrow, beg, buy or steal people’s records or CDs to get the sorts of things that are now available. ‘What I have suggested to a couple of sample CD manufacturers, though, is a mix and match option. There are some great sample CD-ROMs and some bad ones, and for most people, who aren’t as fortunate as myself or the people I work with, spending, say, 250 quid on a sample CD-ROM is a serious investment. For example, I’ve got Peter Siedlaczek’s Orchestral Colours, which was £249, and there’s just one patch I use. It’s a damn good patch, but it ought to be for £250! If you could take only the partitions you wanted from a selection of CD-ROMs, and have the manufacturer burn a composite CD for you, I know sample CD-ROM sales would increase. You could then pay for the partitions you’ve chosen on a pro rata basis — so if one of the partitions you’ve chosen was 20% of the data on a CD, you pay 20% of the cost of that CD for that partition. The manufacturer could then charge you a nominal fee on top for burning the composite disc — say 20 or 30 quid. To write 1993’s Very album, Pete had set Neil Tennant and Chris Lowe up in a demo studio, where they recorded to analogue tape. This time around, it was different, as Pete explains: ‘We went through the same demo process, but for 90% of Bilingual, we recorded into Logic Audio. On Very, Neil used to sing a guide vocal, and if we changed the tempo or key, he’d have to re-sing it. For this album, we were able to just record into the computer, and then alter vocals or fly them about if we changed the track tempo or key. With one track, ‘How I Learned To Hate Rock And Roll’ we just recorded it all into the computer. We got so bored with tape — again, it’s all about speed. Chris had done the backing for that one, and Neil re-jigged the structure, but as soon as he’d done that, he wanted to do some vocals, and as we didn’t already have some pre-striped analogue tape on the multitrack, they just decided to do it straight into the computer, rather than wait about while I cleaned heads and so on, which would have lost them the creative impulse. ‘The only drawback with hard disk is that you can’t drop in and out quickly at all. If you try and drop in a line or a word of a verse, it’s a disaster, as there’s about half a bar’s pause while it goes into record, and mutes the audio already on the track. That’s why I’ve got an ADAT here, so that anything acoustic I need to record here which might need a lot of drop-ins can go onto that, and then I shunt it into Logic Audio. The original plan for the album was for it to have a big South American feel. This is still apparent in a couple of places, such as ‘Se a vida é’ and ‘It Always Comes As A Surprise’, with its cuicas and percussion sounds, but overall the album changed radically between conception and realisation. No track illustrates this better than the opener, ‘Discoteca’, as Pete explained: ‘We started on that song, but then they kept writing new sections, and eventually Neil wrote a new song over the end, which became the second song on the album, ‘Single’. It started when they went out to the States to write some demos in New York, but it sounded a bit dull, so we sampled a few things off it: the noise at the start, the brass that survived to the final track, and some of the percussion. We added some percussion ourselves, and a conga loop, and then they got Sheboom in [a Scottish woman’s collective]. They make their own drums; they just buy the heads and rims, and make the rest of them themselves. We miked them up with ambient mics, and they made a splendid racket, with bass drums, military-type snare drums, shakers, and some big ones like timbales which we recorded separately doing fills. I then chopped all the resulting sections up in Logic Audio later, and took the best bits of each section and looped them — though when I say loop, we’re easily talking eight bars. Me and Bob Kraushaar then spent a while assembling a coherent track. Neil and Chris came in the next day and tweaked it a bit, which was where Logic Audio was so good, as we could totally rearrange this live drum track in minutes. The Sheboom drums on this were recorded at the ‘Discoteca’ sessions, and then I timestretched them up a few bpm, so that they would fit with this track and beef it up a bit. This has a four-on-the-floor programmed rhythm, too; they like doing stuff you’re not supposed to do, and you’re not supposed to do four-on-the-floor at 104bpm or whatever, so they did! Chris Porter produced this track, and was particularly fond of the arpeggiated phrases in the middle eight, which were created in Logic by feeding Neil or Chris [Lowe]’s pad chords into the onboard arpeggiator using the Environment window. Chris Porter is a big Logic Audio user, too, though more on the audio side. So I tended to do the MIDI and he’d handle the audio. As Pete goes on to explain, sounds are the thing — he’s not too bothered how they’re generated: ‘I don’t care how any of my kit makes its noises, whether it’s mice in a wheel at the back or candles burning — the question is, is it useful? They’re just tools to get the job done’. However, this doesn’t mean he has no preferences. Circling the studio, he points out his favourite gear. ‘I couldn’t make a record without an Akai sampler of some description, the Roland Juno 106, and Logic Audio. Logic is the best program I’ve ever come across; it makes my jaw drop with amazement. It’s also amazingly stable. If there’s any performance aspect to an analogue synth line — tweaking knobs on a TB303, say — I’ll record it into a couple of audio tracks.’ Likewise, to get multitimbral operation out of a monosynth or synth with limited polyphony, Pete reaches for Logic Audio. ‘Until the Akai S3000 came out, I didn’t really use samplers for anything musical: just drums and percussion, because you lose too much bottom end off those earlier Akais, and because the filters weren’t so good. But when the S3000 came out, with its resonant filters, I spent a lot of time sampling my Prophet 5, and for about six months, my S3000 acted as a multitimbral Prophet 5. I sampled sounds with the filter deliberately open brighter than I would use usually, made a loud and a soft sample, and spread it over a few octaves. Then I could always back off the filter effect in the sample using the S3000’s filters. This meant that I could have several Prophet sounds running at once if I wanted. Apart from special cases like the Prophet, though, I don’t generally keep synth sounds in the samplers. ‘Of the rest, you can get more enthusiastic about some tools than others. One of the synths here generates all the Pet Shop Boys’ string pad sounds — they wouldn’t like me to tell you which one, though — and cost £350. For that price, it superseded an Emu Emulator II plus a load of samples of a Roland MKS80. That synth never changes its preset — they do like that one! ‘My current favourite is the JV1080, because it’s got the sonic size that we were looking for in the studio, that Roland’s synths used to have. You see, if you want to make a sound smaller, you always can, but if you’ve got a really thin sound, it’s hard to make it bigger. The 1080 has also got top end without sounding too thin. Most of its sounds are really useable, so it’s one of the few synths I use multitimbrally. I think it’s the best thing Roland have done for years. ‘I like the Korg Prophecy quite a lot too, and it’s easy to edit sounds, but it’s harder to program a sound from scratch, because you’ve got all the layered pages to plough through. I agree with what Liam of The Prodigy said in SOS, though — the distortion’s great [see September’s issue — Ed]. I can get the 303 patch in there sounding angrier than my real 303. ‘I also love the Quasimidi Quasar, but I wouldn’t dream of taking it along to a George Michael session, because it’s not bright; it’s dirty and low-bandwidth. It’s got real punch, though, that sound. It’s rubbish for anything sparkly or hi-fi, but it’s great for gritty stuff; the 303 sound on it is almost as tough as the real thing. ‘You can’t be without a TR909 if you’re doing dance music — it’s really tight, which, sadly, the Novation DrumStation isn’t. What that is, though, is a really good sound source — it’s great for programming up patterns and then flicking through the kits. I would recommend it to anyone who wants a 909 and can’t get one — but I have got one, and it definitely sounds tougher and tighter than the Novation. I don’t program it, I play parts into Logic and run it over MIDI. ‘I like to pan things in stereo, so they’re flying all over the place, and the Waldorf Miniworks’ autopanner is good for that; you can get it moving so fast that you get some very weird effects which sound great in clubs. And given the current vogue for filtering everything in dance music, the Miniworks is good for that too. With the Pet Shop Boys, we borrowed the big synth that the Miniworks originally came from, the Waldorf Wave, to experiment with. I would have bought it if I’d been them — the potential it offers is massive — but it’s only got 200 sounds in, and of those only five were actually useable. I can understand, though, because if they were going to spend £6000 on a synth, they’d want at least 100 of the 200 sounds to be useful. With the Pet Shop Boys, when we’re sitting in Sarm studios or whatever, we haven’t got time to program sounds from scratch. It would have taken too long to program enough sounds up to be worth it. ‘My Studio Electronics MIDIMoog is a permanent fixture in my programming rack. The tuning’s stable and it’s generally very reliable. I bought it after I hired one to do a track with Chris Porter, and I was having trouble getting a bass sound. I had stacked loads of synths up to try and create a really big sound, but in the mix it either sounded too loud or it was really mushy, because all the attacks were happening at slightly different times. Then the Moog arrived; I switched it on, and straight away, we all went ‘wow! listen to that!’. It was clear, big, fat, and you could put it at the proper level in the track. It was £1500, which is a lot of money, but if I added up the cost of all the synths I’d stacked trying to get a bass sound, it seemed worth it. I don’t just use it for bass — I’ve discovered loads of other good sounds on it. ‘The Pet Shop Boys have got one of these too, which we use extensively for bass, because you don’t have to do an awful lot to make it sit in a track. And it sounds very different to mine, which is typical for a Moog! This one’s rounder, whereas theirs has a thinner, more Clavi-like sound, though still with plenty of bottom end, so it occupies a very specific space in the mix. I read in your interview with Steve Rodway [see SOS June ’96] that he samples his Moog to lose the sub-bass, and I’ve done that too, to try and thin mine out a bit. Sitting at the bottom of Pete’s recording rack is an expensive Massenberg EQ. ‘That’s a big part of how I get things to sound good here; it’s permanently sitting over the desk’s output to EQ a complete mix. You shouldn’t be afraid to EQ an entire track — after all, that’s what they do at a mastering plant. That goes into the SSL compressor when I’m mastering. On cheaper desks, you can’t get clean top end, whereas with that thing, I’ve got about 5dB at 16kHz, and it just adds sparkle, no distortion or phase-shifting. If you’ve got a mix that sounds brilliant, but is all too bright, it’s a five-second job to dull it off with that, rather than go through every desk channel trying to do it that way. A couple of the Sarm engineers swore by it, and mastering rooms have it, too, which put me onto it. Then, one day, I walked into a shop and saw this one going second-hand, but they didn’t know what it was, so I got it for about half-price! ‘My Alesis Microverb II is really good for a nasty, cheap reverb sound. I’ve got a Lexicon PCM80 for expensive-sounding reverb, but it’s like I was saying about the Quasimidi Quasar — if everything’s spangly and pretty, it sounds horrible, just as it sounds horrible if everything’s dirty and grungey: you have to find a blend. I use the Microverb II a lot on drums, just for a bit of ambience. The PCM80 I use on vocals, and my Lexicon LXP1s are for general-purpose reverb. I can recommend the Sony HRMP5 — that’s a great little box, and it’s only 299 quid at the moment! ‘When the Pet Shop Boys are writing, it’s generally just myself, Neil and Chris. Both Chris and Neil have got Logic at home, but they just put down the barest ideas; Chris a bit more than Neil, because Neil likes to write a lot on his guitar. That explains why their chords are often so nice, because Neil voices his keyboard chords exactly like the guitar inversion — so because they’re not played from a keyboardist’s point of view, you get these very interesting chords. Neil is also very good at structure and melody, while Chris is more aware of rhythmic elements. That’s not to suggest that Chris isn’t aware of chords, but his priority is rhythm. He’s a mine of ideas, and the hard thing with him is keeping up with his output; he can put a track together in minutes. That’s also why I record everything he does. He’ll often say ‘just let me rehearse this’, but the first couple of times he tries something, he’ll come up with something brilliant that you wouldn’t get again if you didn’t record. All it takes is a tap on a space bar with Logic, and you can always get rid of it if it’s no good. ‘On the track ‘It Always Comes As Surprise’, the weird chord at the beginning and end of this track came about when Chris was looking for a way to end the song on his keyboard, and said ‘oh, this needs something like this’ — and spread his fingers and just hit as many keys as he could. I was in record as usual, and so it was captured. Neil thought this was a great idea, and rewrote the chords at the end of the song so that they flowed properly into the chord Chris had played. In the end, Neil was so fascinated by the strange sound that he put it at the start of the song as well. ‘When I record Chris, I cycle everything around eight or 16 bars in Logic Audio, and he’ll play stuff in over the top, say percussion, drums, bassline and some chords — until he’s finished a section. At this point, Neil will listen to what Chris has done, and maybe ask to hear the chords in a different order to the way Chris has played them, so I’ll do that for him; or he might re-voice the chords. That might then inspire Neil to write another new section… Their songwriting partnership is very collaborative.